The purpose of this network is to work beside the school’s initiatives with a focus on our Pasifika students’ learnings and outcomes. Rosarina Pilliissi was Best All Round MAGS Pasifika Student for 2018 and, along with Liam Akeli, won the Tagaloa Peter Su’a Award for Performing Arts. We work beside the leadership and guidance of Ms Fiona Barker, Ms Va Anisi and Mr Api Taulapiu and are actively supported by Headmaster Mr Patrick Drumm. Our role is to support any initiative that sits within these great teachers’ portfolios and to facilitate, drive, support and implement best practice for our students for the betterment of their future beyond MAGS. We are here to support all Pasifika parents as we aim to ensure that our students leave school with the highest qualifications possible, giving them the potential for even better career opportunities than we have had. We encourage you to join us – get on board our Vaka as we paddle and build a map for our children’s success in years to come. Every Tuesday and Wednesday, 3.15pm-4.45pm in the Library. Supervised by teachers and Year 13 mentors, and tutors are there to help with most subjects, in particular Maths, English and the Sciences. 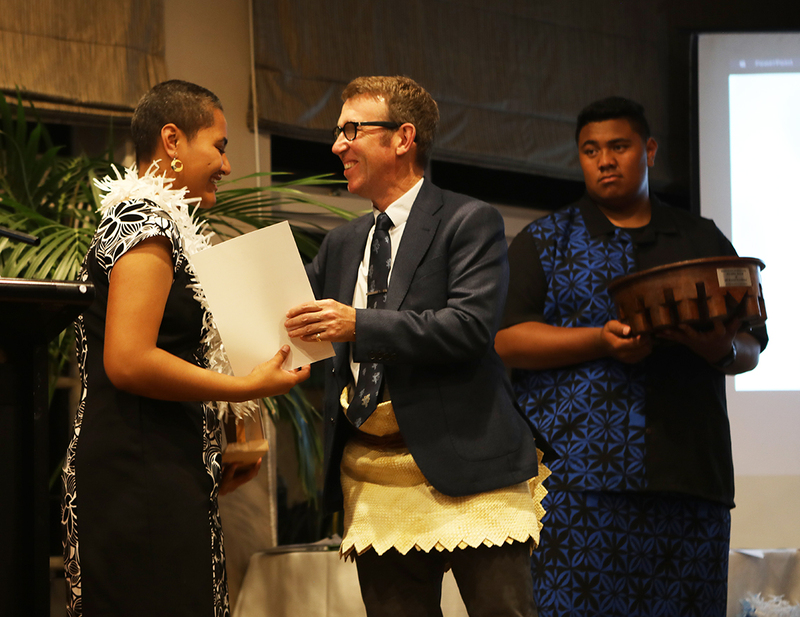 Headmaster Mr Patrick Drumm congratulates Deputy Head Girl Rosarina Pillissi, the Best All Round MAGS Pasifika Student for 2018. The Pasifika community came together at the annual MAGS Pasifika Dinner to acknowledge and celebrate the success of MAGS Pasifika students in Academia, Sports, the Performing Arts and Service to Pasifika and the school. The dinner, on Friday, 26 October at Sorrento in the Park, also acknowledged Tupuola Apisaloma Taulapiu for his 26 years of service as Pasifika Liaison to Mount Albert Grammar School. He joined the school in 1992, and since that time, he has worked closely with our Pasifika students, the staff and our Pasifika community. He has been part of the school’s strategic plan in raising academic achievement and ensuring the well-being of our students. He is the first Pasifika person to have been acknowledged for this and he was congratulated and thanked for his ongoing loyalty and support to Pasifika. There was also thanks to the Pasifika Parents’ Network (PPN), under the leadership of Katerina Taumaoe, for their tireless work year-round, fundraising so that our dinner allows us to celebrate the successes and for as many students as possible to attend. Without their support the success of this event would not be possible. The Best All Round MAGS Pasifika Student for 2018 is MAGS’ Deputy Head Girl Rosarina Pillissi (pictured above at centre), who was also named Top Year 13 Pasifika Academic Student and Best All Round. 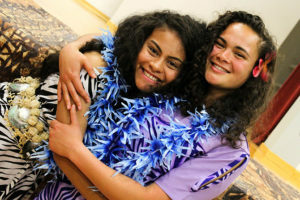 Along with Liam Akeli, she won the Tagaloa Peter Su’a Award for Performing Arts, and Rosarina also won the Ulugia-Pua Award for Outstanding Services to Mount Albert Grammar School. 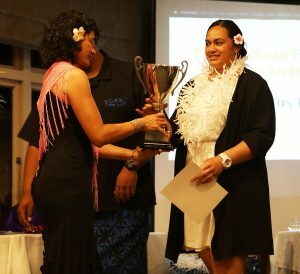 Cyprus Taumaoe won the Ah Kuoi Family Cup for Services to Pasifika. 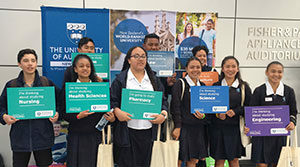 During the year, Rosarina was also awarded the following scholarships: University of Auckland Pasifika Academic Excellence Scholarship, University of Otago Pasifika Peoples Entrance Scholarship, First Foundation Scholarship and Hi -Well Scholarship. Top Pasifika Sportswoman and Sportsman awards went to Sharne Pupuke-Robati and Soane Vikena respectively. Floyd Watch, one of the leaders of MAGS’ successful Niuean group at PolyFest, was awarded the Tupuola Apisaloma Taulapiu Cup for Cultural Leadership. Cyprus Taumaoe, pictured, won the Ah Kuoi Family Cup for Services to Pasifika. Top Year 12 Excellence: Maraea Ah Kuoi Atmore, Theresa Anisi, Aka Bloomfield, Alyssa Houma, Hannah Jones, Nathan Su’a Chang and Siana Vagana. Top Year 13 Pasifika Students: Hannah Fale, Porcia Meredith, Rosarina Pillissi, Roselyne Va’ai, Rosemary Tatupu and Elijah Manu. Clarke Aiono, University of Otago Performance Entrance Scholarship; Roselyne Va’ai, AUT School Leaver Scholarship KIWA (Maori & Pasifika Student); Grace Twigley, AUT School Leavers Scholarship KIWA (Maori & Pasifika student). Headmaster Mr Patrick Drumm with the 2017 Best All-Round Pasifika Students, Aaron Fa’asalafa and ‘Alosi Bloomfield. MAGS’ top Pasifika students were acknowledged and celebrated at the 2017 Pasifika Celebration Dinner on Thursday, 26 October. Year 13 Dean Ms Katie McColl with the Top Year 13 Academics, Vaimoana Va’ai and William Sharkey. Vaimoana Va’ai won the Year 13 Award for Academic Excellence, and William Sharkey was named Top Year 13 Pasifika Boy (left). Vaimoana, Fia Jones and Head Boy Denzel Robertson were announced as having won University Scholarships for 2018. The Year 12 Academic Excellence award went to Roselynne Va’ai, who was also named Best All-Round Year 12 Student, and Excellence Awards were made to Tara Pickering and Rosarina Pillissi. 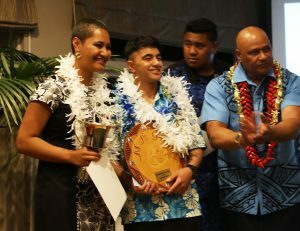 Elijah Manu was named Top Year 12 Pasifika Boy. The Year 11 Academic Excellence Award went to Hannah Jones with Excellence Awards to Theresa Anisi, Kalyah Atai and Siana Vagana. The Top 11 Pasifika Boy was Nathan Su’a Chang; the Best All-Round Students in Year 11 were Maraea Ah Kuoi-Atmore and Aka Bloomfield. The Best All-Round Pasifika Students for 2017 were Deputy Head Girl ‘Alosi Bloomfield and Aaron Fa’asalafa. The Tagaloa Peter Su’a Award for Services to the Performing Arts went to Liam Akeli and Vaimoana Va’ai for their achievement and service in Music, Drama and Dance. Mrs Ah Kuoi with her family, which includes four former Head Boys of MAGS. The Pasifika Sportsman and Sportswoman Awards were Javvier Pitovao for Rugby League and ‘Alosi Bloomfield for Football. The evening included speeches by Headmaster Mr Patrick Drumm, guest speaker Inspector Fata Willie Fa’anene of the Waitakere Police, and Head Boy Denzel Robertson. There were performances by the Samoan Girls’ Cultural Group and Cook Islands dancer Lausapai Nikoro, and the Year 13 Taualuga. Albertian police are pictured with Pasifika Prefects and leaders, guest speakers Detective Inspector Fa’amanuia Va’aelua (back row, centre) and Detective Constable Fiao’o Fa’amausili, also Captain of the Black Ferns women’s rugby team, Headmaster Mr Patrick Drumm and Head of Pasifika Initiatives Ms Va Anisi. 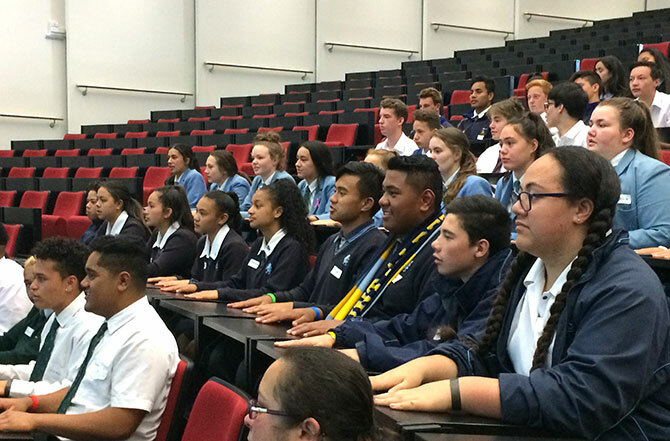 A dozen Albertian police officers attended the final Pasifika Assembly of the year to encourage students plan a career, and consider policing. The Captain of the Black Ferns women’s rugby team, Detective Constable Fiao’o Fa’amausili, also attended, with her message particularly aimed at Pasifika girls. Detective Inspector Fa’amanuia Va’aelua, whose daughter Aleisha is in Year 9 at MAGS, has been a policeman for nearly 30 years and is now one of the most highly ranked Pasifika officers in the country. He is in charge of co-ordinating serious crime investigations in the Counties Manukau district. Detective Inspector Va’aelua, who was awarded a Queen’s Service Medal for going above and beyond his duties to help the community, was backed by 12 Albertian police who had gathered from stations all over Auckland. Detective Constable Fa’amausili, who led their Black Ferns to their fourth World Cup victory in August, said women and Pasifika people were still under-represented in the police, but that should not hold back Pasifika girls from considering the police as a career. MAGS’ Pasifika students celebrated new milestones in academic and leadership success at the Scholars’ and Leadership Assemblies in February. Four students gained five NZQA Scholarships between them, and a record 19 were endorsed with Merit or Excellence in NCEA Level 3. In Leadership, Denzel Robertson was named Head Boy, and ‘Alosi Bloomfield is Deputy Head Girl. A record 14 Pasifika students feature among the 2017 Prefect team. Denzel Robertson (far left) is MAGS’ Head Boy for 2017, and ‘Alosi Bloomfield (far right) is Deputy Head Girl. Pasifika students who gained Excellence in NCEA Levels 1, 2 and 3, and who attained NZQA Scholarships, received their Scholar Lion badges at the Scholars’ Assembly on Monday, 20 February. Luke Fitzpatrick gained two Scholarships in Calculus and Statistics, 2016 Head Girl Leilani Ioelu attained Scholarship Statistics for the second time, Lorenzo Vea’ila gained Scholarship Drama, and Monique Kost attained Scholarship Dance. Only the top 3% of students who sit a Scholarship exam are awarded it. 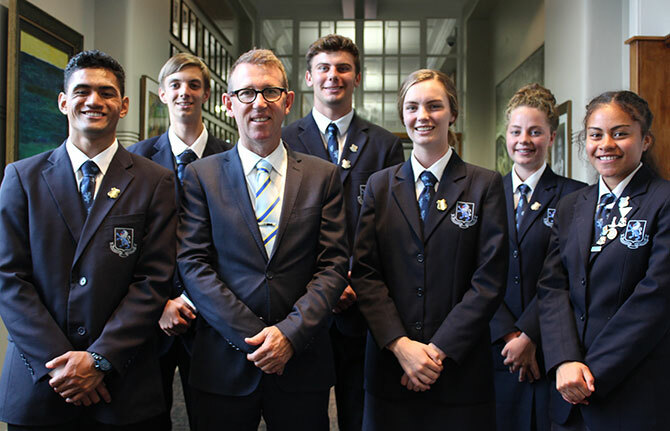 Six students gained NCEA Level 3 with Excellence: Luke Fitzpatrick, Isabella Ieremia, Leilani Ioelu, Monique Kost, Caitlin Pritchard and Sabian Scott. In addition to Denzel and ‘Alosi’s appointments to the Prefect Executive, the following Pasifika students were named as Prefects for 2017 at the Leadership Assembly on Thursday, 16 February: Aaron Fa’asalafa, Noah Foster, Fia Jones, Lausapai Nikoro, Desmond Petelo, Javvier Pitovao, Ceylonese Taumaoe, Ethan Taumaoe, William Sharkey, Paris Shum, Shakthi Singh, Vaimoana Va’ai. The 14 Prefects will lead the Pasifika Council. Year 12 leaders will also contribute to the leadership group. Nine students in Year 10 attended Auckland University’s BEAMS 2016 programme on 29 November to have a taste of what some of its faculties have to offer. Tangiwairoa Cook, Darhys Simone, Mercer Davis, Philip Taua, Abbey-Jean Kaipara, Aka Bloomfield, Assina Te Paa-Kolio, Tuhaka Te Pou Kohere, Mary-Jane Vavetuki were exposed to areas at the University where Maori and Pasifika students are under-represented. These are Business, Engineering, Architecture, Medicine and Science, hence the acronym BEAMS. The students took part in interactive workshops to explore each of the faculties. At the Business school they had a go at being managers of the Warriors rugby league team; in Architecture they built support structures from paper; in Engineering they designed their own web page; in Medicine they tested each others’ reflexes and blood pressure; and in Science they put eggs in protection capsules and dropped them from a height to see if they would ‘survive’ the fall. The day ended with four of the Mags students winning the “Most Valuable Player Awards” out of the firve participating teams. MAGS’ top Pasifika students were acknowledged and celebrated at the annual Pasifika Celebration Dinner on Friday, 28 October. Luke Fitzpatrick and Head Girl Leilani Ioelu won the Year 13 Awards for Academic Excellence. The top Year 12 student was Vaimoana Va’ai; the top Year 11 student was her sister, Roselyne. Leilani also won the Best All Round Pasifika Student award. The Tagaloa Peter Su’a Award for Services to the Performing Arts went to Ruth Alesana and Siosiua Atuekaho for their achievement and service in Music, Drama and Dance. The Pasifika Sportsman and Sportswoman Awards went to the two students who are also the school’s Victor Ludorum and Victrix Ludorum for 2016, Paul Roache and Caitlin Pritchard. The evening included a speech by Headmaster Mr Patrick Drumm, performances by Siosiua and the Cook Island Cultural Group, and the Year 13 Taualuga.